People who live in these nine states have a reason to sing the economic blues: Nevada, Florida, Arizona, Connecticut, Michigan, Maine, Georgia, New Jersey and Illinois. 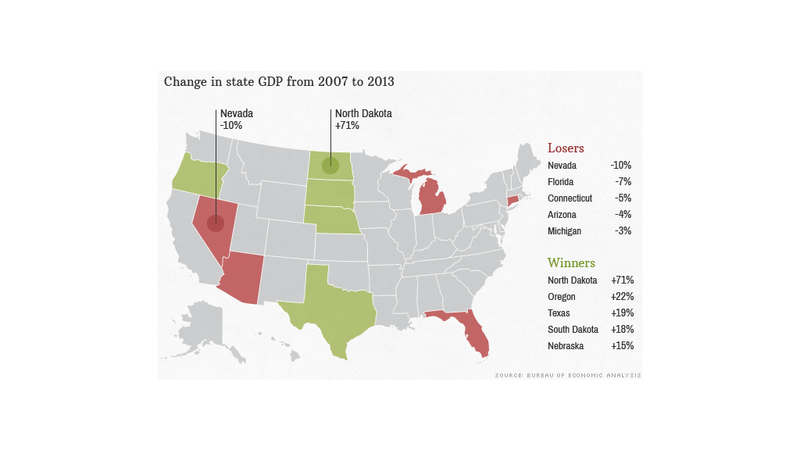 These states have yet to recover from the recession. The first five states on that list are in a particularly bad funk with their economies far below where they were back in 2007. Call it the lingering curse of the housing bubble burst. Many of these states are still trying to restart their real estate and construction industries, and it's a road block to economic daylight. Nevada's economy is still about 10% short of where it was in 2007. About half of that shortfall can be chalked up to construction's slow ascent from the depths of the recession, when the state lost more than half its construction jobs. Additionally, tourism and real estate continue to slow things down. There have been a couple of bright spots in education, health care and mining, but the jobs there aren't nearly enough to replace everything's that's been lost. And Las Vegas' reputation as the nation's playground means that when things turn sour nationwide, sectors like tourism, responsible for about 14% of the state's economic output, declines. "There's too much reliance on construction and tourism in general," said Mehmet Tosun, chair of the economics department at the University of Nevada, Reno. Like Nevada, Florida's construction and real estate industries have been impediments to its economic recovery. There are signs of a turnaround in 2014 thanks to a boom in building in places like Miami and Orlando. Len Mills, executive vice president of the South Florida chapter of builders trade group Associated General Contractors, said he's heard from other builders that there's been a skilled labor shortage. "If they're in the trades, we could use them down here," he said. Like other states and the nation as a whole, health care continues to grow much faster than almost every other industry, with 10% more health care jobs in Florida than December 2007. In fact, job growth in the sector never stopped. The state's economy actually grew a robust 2.2% in 2013, but the Sunshine State started in such a hole that there's a tough climb to go. The long-term decline of Connecticut's chemical manufacturing sector, where employment peaked back in 2000, continues to dog the state, and the 2007 recession only exacerbated the problems that were already there. Additionally, the slowdowns in wholesale trade, insurance and yes, construction, have also conspired to hamper the state's recovery. Of the five states furthest from a full recovery, Connecticut is the only one whose real estate sector is currently doing better than before the recession, though jobs in the industry are still 8% lower than they were in December 2007. Related: These 10 state economies grew the fastest last year. Arizona's construction industry was cratered in the recession. Building jobs have fallen 41.5% since the recession, though employment in the area began falling more than a year in advance. Things were in such bad shape that an industry trade group filed for bankruptcy, and the Arizona Contractors' Association, a building industry trade group, filed for bankruptcy last month. Wholesale trade has also fallen short of its economic output before the downturn. On the other hand, finance and electronics manufacturing are doing their part to help the state economy rebound. Though finance and insurance jobs are 4.5% higher than even the pre-recession peak in April 2007, electronics manufacturing jobs are still 16% lower than when the recession began, suggesting not all of the industry's gains have translated into higher employment. The struggles of Michigan's auto industry are no secret, and the sector's continues to hold the state's recovery back. Its peaks are still behind it, with parts topping out in 2000 and vehicle manufacturing reaching its height 24 years ago. Though vehicle manufacturing is still 28% lower, the larger car parts business is employing just 7% fewer folks than before the recession. Construction and local government are also hampering a full comeback. A bright spot in Michigan, the state among the five slowest to recover that is the closest to actually getting back to speed, is its heath care industry. Health and social assistance jobs are up 6% to 560,000.